Costa Rica - The last couple of days in the rain forest photographing SO much wildlife! Most of what we photograph during my photo tours in Costa Rica are animals in the wild. But on a couple of the days, I take the group to locations where we can photograph some of the wildlife in a more controlled environments. On one of these controlled days, we visited a sanctuary where animals are rescued and rehabilitated. And since I have been to this sanctuary before, I had a good feeling we would be spending time with my friend Sweetie. Sweetie is a Spider monkey who was rescued when she was just a baby. She has lived in the sanctuary for her entire life and is very used to people. This allows us the opportunity to photograph her with ease. And she is a total ham and loves people and the camera. We took a 30 minute boat ride to the sanctuary, since it is the only way to get there. There are no roads to this part of Costa Rica, We arrived on the beach, and just like my last visit, Sweetie was on the beach waiting for us. Since we could go right up to Sweetie, I could even use the Canon 100-400mm lens to take a photo looking down at her. The reason that these monkeys are called Spider monkeys is due to their extremely long arms and hands. You can really see that in this photo! We got up close and personal with parrots too. Even though we had seen numerous sloths in the wild, it was fun to get into a cage with three of the Two-toed sloths and get some tight shots of them. I almost didn't bother shooting photos in this caged area, since it was so dark. But at the last minute I decided to push the ISO of my Canon 5D Mark IV to 6400 and got this photo (which is one of my favorites from the trip). I am totally amazed out how clean this image is, even at ISO 6400. No, this is not an old photo from "Gilligan's Island", this is a photo of our group. After visiting the sanctuary, we went to a botanical garden, which is actually the front and back of a private home. The owners have spent the last 30+ years building and maintaining these amazing gardens. It was a great place to key in on butterflies, birds and flowers. I thought that this was a multicolored bamboo, but it is not. It is actually a palm tree. Regardless, it is so cool to see these colors in the trunk of a plant. We were walking the property when some of our guests spotted this Parrot eating in a tree above us. That evening we took the hour long boat ride back to the resort for another nice dinner. At dinner, I asked our guides if we could do another tree frog shoot and they readily agreed. These guys are amazing at finding these little gems in the surrounding plants. When I was in Costa Rica in August (for the trial run of the photo tour) the guides found some tree frogs to shoot, but we did not have great lights. This time around, I was prepared, and brought some little LED lights. We took turns holding two lights to properly light the frog, while the others took photos. And, as you can see, the photos came out better than we thought they would. Jose (one of the guides) spotted this tiny snake on one of the nearby plants and asked us if we wanted to photograph it. We were already shooting with our Canon 100mm macro lenses and moved to their plant to get some shots. This snake looks pretty large in the photo, but was really quite small. The body was almost as thin as a worm. The next day we woke up and headed out for another drive into the rain forest, looking for monkeys and more. Not far from the White-face monkeys, we came across some Howler monkeys and their babies. I stood right below this one and shot straight up on her and the baby. Another parent and baby Howler. I loved how the tail of the adult curves through the frame. It was a good monkey day for us, as we then found a pack of Spider monkeys hanging around (pun intended). The next day was our last full day on the Osa Peninsula. I woke up early and heard a bunch of Scarlet Macaw outside my room. I could not resist the temptation and decided to get up and photograph these birds once again. It still amazes me that these birds fly around the resort in the wild. Walking the property, I even came across another Crocodile who was swimming in the nearby river. I loved the reflection of his mouth in the water and grabbed this shot. Then we were off to a chocolate plantation for a tour and lunch, followed up by a visit to a new butterfly house. The butterfly house was still under construction, but they had a couple of species there for us to photograph. Since Canon is nice enough to loan cameras and lenses to all my workshop attendees, we all had Canon 100mm macro lenses to get in tight on these insects. The people who run the Interactive Gardens also found a Green Iguana for us to photograph. This iguana was very cooperative, and let us get nice tight shots of him before he moved on. Look at the detail in the head of the iguana. The 100mm macro lens is so darned sharp! I had never photographed the green iguana this close before, and was very happy to have these photos for my collection. The next morning, we all packed up and flew out, heading back to the U.S. for Thanksgiving. It was sad to leave this amazing place, but we all had a great time together, making new friends and getting killer images. If you are interested in joining me in Costa Rica, check out this web page for more information. We have 4 remaining spots for the trip next August, and then two more trips in 2019 which will be announced soon. 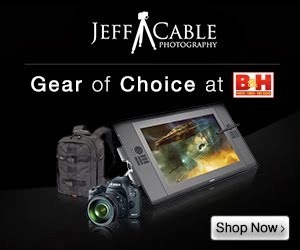 First Time Ever - Holiday Special from Jeff Cable Photography! For the first time ever, you can get 25% off all of my signed Fine Art Gallery prints for the holidays. You can order any photo from the gallery, or even email me a favorite that you have seen on the blog (other than images of Olympic athletes which I can not sell), and I will have that printed on fine art paper, hand sign it for you, and have it sent in time for the holidays. The coupon code is: HOLIDAY2017. This special will be live for ONLY 3 WEEKS and included many of my favorite photos from the last 10 years. These will make great presents for your friends and family. Each photo will be printed on fine art paper and hand-signed (personalized if you desire). 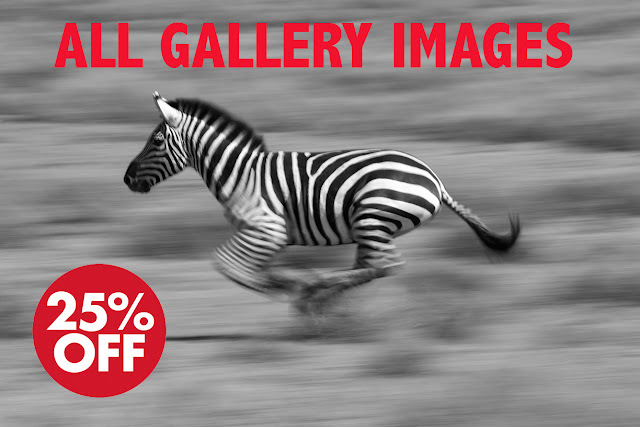 Here is your chance to get an original photo at a great price. And as a bonus, if you order more than one photo, I will include a Jeff Cable Photography hat for you. Costa Rica - it was one of our free days, but that did not stop us from shooting birds and crocodiles. My workshop in Costa Rica is here for more than a week, so I added two free days for people to relax or do other activities (zip line, kayak, spa). And even though people are taking advantage of the other activities, we still started the day with our bird photography. The resort has bird feeders in numerous places around the main lodge, which attracts all these amazing species. After lunch, some people went to the spa and others took a nap. I walked down to the creek and found this Caiman lounging in the water. I took a couple of photos but was not happy with the high reflectivity of the water. I walked quickly back to my room to grab my Tiffen Circular Polarizing filter hoping that he would stay in the same spot long enough to get a better shot. As you can see, the Caiman was nice enough to stick around for another 10 minutes so that I could get this shot. For those of you who are into photography, take a minute to compare the two photos to see how much of a difference the polarizing filter made. It removed all of that glare from the water and made a much better final image. I was walking around the property here at Crocodile Bay when I saw Bob and his wife Tracy in the front of the property. I told them about the cool caiman in the water and they told me about a group of Macaw that were hanging out in the trees. We both went our different directions to get new photos. I have captured many photos of the Macaw on this trip, but have been working hard to get some nice shots of them in flight. I am still working on that challenge. This was one of the best so far. Later in the day I saw Tracy once again. Bob was not feeling great, and was taking a rest. But Bob gave her his loaner Canon 5D Mark IV and Canon 100-400mm lens to play with. Even though she is on the tour as a non-photographer I reveled at the chance to teach her about photography. I explained aperture, shutter speed and ISO and worked with her on camera settings. I also showed her the best way to hold a big camera as steady as possible. In the distance, we saw this Road-side hawk in a tree. I showed her how I take a photo and then creep closer to get a tighter shot. We then repeated this to get as close as possible to our subject. She steadied the big camera and got a shot just like this one. It was so awesome to see someone learning the basics of photography and nailing a great shot. It was another awesome day in the rain forest. The storm which had previously dumped a ton of rain on us was now gone and we had our first day without rain. And then sunny skies would remain. Stay tuned for more photos from this photo tour. Photographing birds and frogs in Costa Rica - Nature's awesome colors! The past couple of days have had unusually high rainfall even for this area of the rain forest. I think we have amassed 5 or 6 inches of rain in the last 48 hours. But that has not stopped us from having a lot of fun and getting great photos. For the past couple of mornings, we have sat on a covered patio here at the resort and photographed many of the local birds after breakfast. This has proven to be a really fun start to the day, and is the perfect way to wait out the rainstorms before heading out to our destinations. Here are some of the birds that we have captured during our post-breakfast meet ups. This is the female Red-leg honey creeper. Here is a Grey-blue tanager. ...and because I love the look of this bird so much...a second shot. This photo was taken on one of our outings. You can see the rain drops coming down around the Yellow-headed caracara (part of the falcon family). Yesterday we made the drive to one of my favorite places here on the Osa Peninsula, where we have ample time to capture macro photographs of some of the local amphibians. And of course, this includes my favorite, the Red-eyed tree frogs. We were all shooting with Canon 5D Mark IV cameras and Canon 100mm macro lenses. My job was to help the workshop attendees get great shots of the frogs. I would give them suggestions of composition, camera settings, and even ways to get the most of their Canon 100mm macro lenses. I would help them get their shots, but that did not stop me from getting some shots of my own. This is my favorite photo of the trip so far, with the Red-eyed tree frog looking right at me. It was fun to get photos of the tree frog on the Ginger plant. It helped to accentuate the red in the frog's eyes and added dimension to the photos. This photo makes me laugh. I think I need to turn this photo into a poster-sized print with a caption that says "Having a tough day? Hang in there!" As I mentioned, I was suggesting different ways to photograph the frogs. I encouraged the others to shoot photos from under the leaf, showing both the frog's head and the silhouette of his body. After photographing the red-eyed tree frogs, we stopped for some lunch. After feeding ourselves, our guides went out into the rain storm to see if they could find us any poisonous dart frogs to photograph. They found this Granulated poison dart frog and we continued our macro shooting. We shot handheld for a while, and since this frog was not moving too often, I encouraged everyone to use their tripods to guarantee themselves sharp photos. We all took a lot of tight photos of this frog and I was looking for a different composition. I framed this tripod shot to show more of the plant (out of focus) with the poisonous dart frog (in sharp focus) at the top of the frame.